Of course some of the most beautiful desserts are also the most delicious. We eat with our eyes and I’m not suggesting that cooks and chefs shouldn’t do everything in their power to make food look as enticing as possible. But sometimes it’s important to look beyond appearances, to crack open an oyster and enjoy it in all its glistening, undeniably ugly glory, to take a risk on a hairy lychee or scary looking tentacle of squid, because often the beauty is as much in the eating as in anything more superficial. 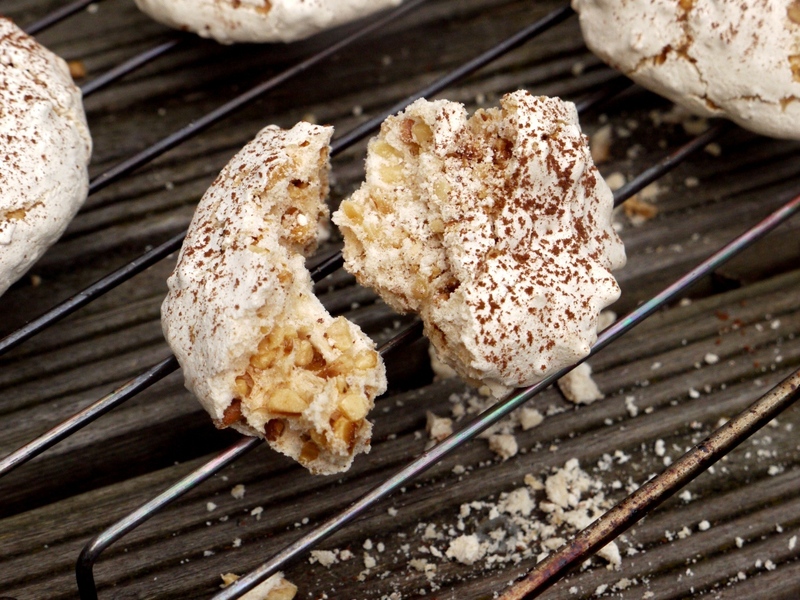 Translated from the italian, brutti ma buoni means ‘ugly but good’. If there were a Classifieds equivalent in the baked goods world, these biscuits would be the ones with ‘a great personality’. Uneven in appearance with lumps of chopped nut cracking through a broken, cratered surface, these little Italian meringue cookies aren’t going to win any beauty awards against their elegantly swirled meringue cousins, but they do taste really very good. On Thursday I’m off to Italy on holiday. For the first three days we’ll be by the sea in Le Marche, staying in a hotel, eating out (including a meal at one of my favourite restaurants in the world), drinking delicious wine and overindulging in every possible way. Then on Sunday we’re heading to Tuscany for a week at my parents’ house in the hills. With eight people to feed, an abundance of incredible local ingredients and a lot of long, lazy days on my hands, I’ve started to do a little bit of menu planning. Because it’s a holiday home, the kitchen in Italy isn’t that well equipped. And not just to cake-pan-hoarding, cookbook-obsessed, incredibly expensive Kitchen Aid stand mixer-owning little loaf standards: we don’t even own a whisk. Having investigated the kinds of things you can make when lacking almost entirely in any kind of kitchen gadgetry, it’s become pretty clear that a whisk is an essential item in making a whole load of otherwise fuss-free desserts. I’ve therefore decided to tuck one into my suitcase in between the bikinis and books and beach towels, but otherwise the only other thing I’ll be bringing are handwritten recipes for all the things I’m planning to make. There will be homemade gnocci and pesto made with basil from the biggest plant I’ve ever seen, tagliatelle al ragu, wild mushroom risotto, melting fagioli all’ucceletto, Chianina beef barely introduced to a BBQ and cut into thick, bloody slices, olive oil smashed potatoes and ribbons of courgette with chilli, fiore di zucca stuffed with creamy ricotta and corn-fed chicken marinaded in vinegar and sage. For pudding we’ll be eating the freshest fruit salad, an Italian-inspired Eton mess, the obligatory tiramisu with a good glug of vin santo, tiny truffle-like chocolate pots served in espresso cups and these, the ugly duckling of the dessert world. The recipe below comes from Jacob Kennedy’s inspirational Bocca di Lupo cookbook. If you love Italian food and don’t own a copy, I urge you to go out and buy it now. Not only are the savoury dishes reliable and delicious, it contains some of the most incredible desserts, from amazing ice creams (visit London’s Gelupo and you’ll start to see what I mean) to regional baked goods like these brutti ma buoni. Below are quantities for between 20 – 30 biscuits, depending on size. Like meringues, these little treats last a fairly long time in an airtight tin and can also be frozen. I’m planning to serve some alongside those chocolate pots, then crush the rest into a sort of Italian-inspired Eton mess made with fresh peaches, mascarpone and cream. I literally cannot wait. Preheat oven to 150 degrees C. Line two baking sheet with parchment. Whip the egg whites to soft peaks, then gradually add both sugars to obtain a luscious, dense meringue. 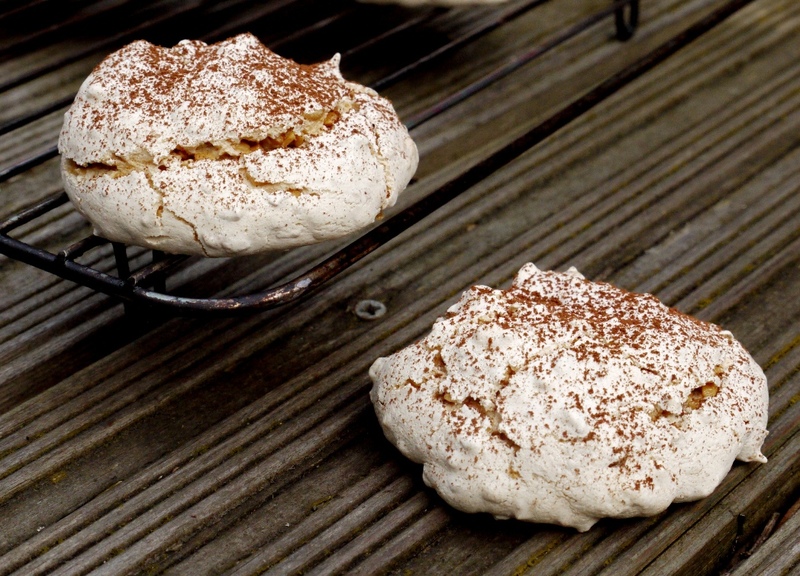 Warm the meringue in a heatproof bowl over a saucepan of simmering water, turning carefully with a metal spoon until slightly less dense and the meringue becomes glossy. Remove from the heat and fold in the chopped nuts. Dollop heaped tablespoons of mixture onto your prepared baking sheets, leaving 2cm gaps between each. Bake for approx. one hour, or until amber and crunchy. The longer you cook them, the crisper they will be so you want to try to catch these biscuits whilst the middle is still slightly soft. Dust with cocoa whilst still hot then serve at room temperature. Delicious! Have a brilliant time in Italy. I love the sound of your Italian-style Eton mess. So unbelievably jealous of your holiday – have a fantastic time! Thanks for the heads up on the Italian cook book Im going to take a look. Theses biscuits look wonderful. I hope you have a fun holiday with as much food as you can handle! Personally I don’t think these look ugly at all. They look delicious! Crunchy and nutty…I am in love with these biscuits. That menu! Oh my goodness, my mouth is watering and I wrote every single item down as inspiration for summer cooking. There is one vendor at the markets here in Zürich who specializes in Italian produce and I can’t wait to see what he has to offer in the upcoming weeks; hopefully some zucchini with flowers still attached. Have a wonderful trip and thank you for sharing this biscotti recipe. Glamorous Glutton – ooh, that sounds nice! My Kitchen Stories – it’s a brilliant book, do give it a go. Nic – thank you, looking forward to sharing! Argone – thank you. It’s all about smuggling kitchen equipment abroad! Meg – I think they’d make lovely presents, and they keep really well. Angie – glad you like them! Talley – ahh, thank you. Zucchini flowers are one of my favourite things in the world. 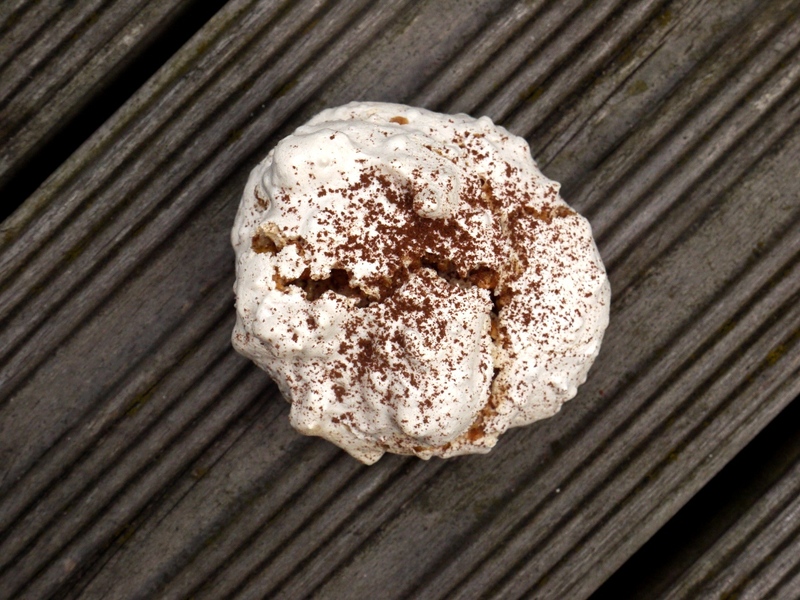 I admit, I’m still a bit nervous about meringues, but I will definitely take your advice on Gelupo! Ever since working in a bakery, I always get frustrated if my desserts aren’t looking gorgeous. ‘Ugly’ desserts are good for me. 🙂 But, I don’t think this looks ugly at all! I think they’re gorgeous – but then I do love ugly-but-tasty food. Have a fabulous time on holiday! Italians have a way with rustic desserts, or food in general. 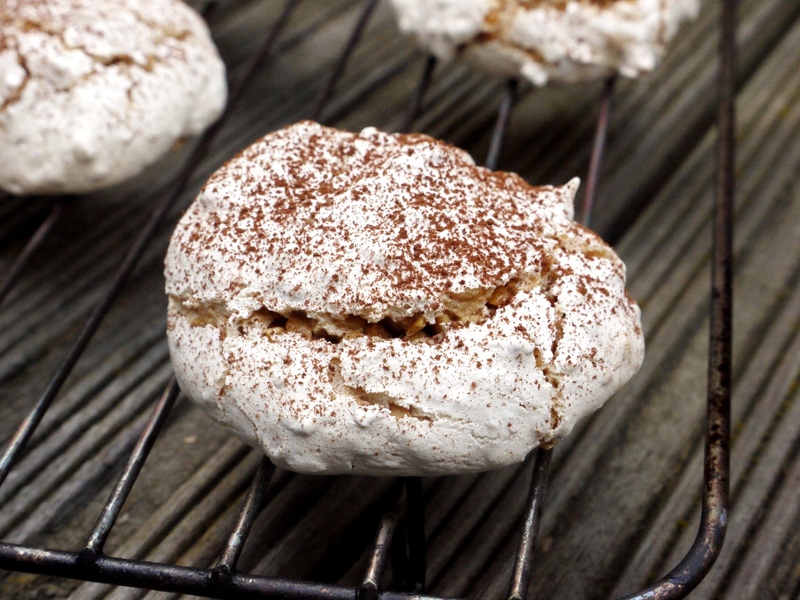 Amazing meringue cookies with one of my favorite nuts! Enjoy Italy for me! thank you! have a wonderful trip. Baking Beardy – oh, Gelupo is heaven! Laura – I love shopping abroad, so many exciting things to discover. Elaina – thank you so much! Amy – they’d be delicious with coffee. You could probably also put a little ground coffee into them for extra flavour. Isn’t the ugliest food always the tastiest? 🙂 These do sound delicious in every way! Often foods that don’t photograph well have the most love put into them. 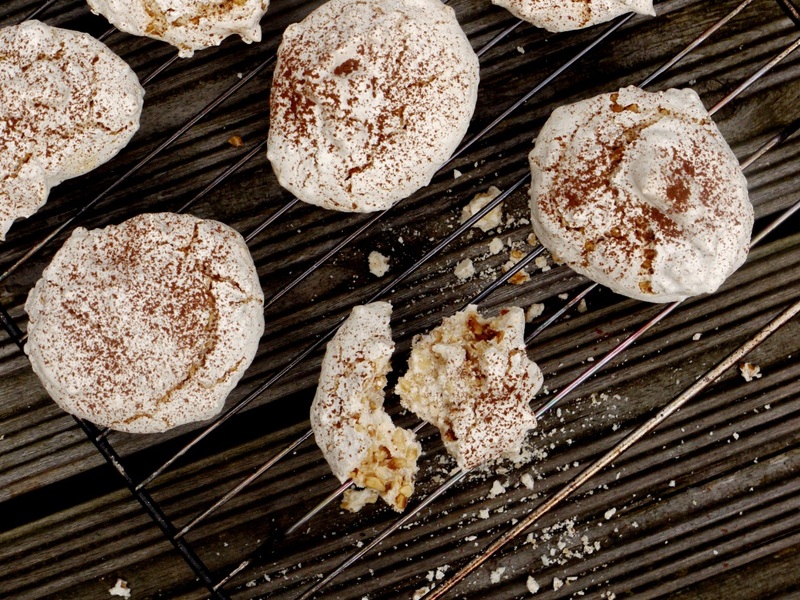 See soups, stews, and in this case, meringues. I don’t think these are ugly cookies at all, I think they look wonderful! Have a super holiday, my first day back at work today has been pretty tough! I think they look quite beautful! Your planned holiday sounds amazing and is one destination I have on top of my list! Are you sure you don’t have room in your suitcase! Love these cookies and yours look fabulous! Can I please be packed in your suitcase along with the whisk? I have a hard time calling these gems ugly. I love the simple but exquisite food of Tuscany. I would love to have the opportunity to go myself one day. Have a wonderful time! I love the look of these and as I’m a big fan of macaroons I think I’d love the taste of them too. Substituting the almonds for hazelnuts has got to make them even more delicious. Substance wins for me over style every time, but these have their own style. Urvashi – haha, if I had room I would! Sasha – definitely give them a go, they are so easy! Choclette – there’s something about hazelnuts which just gets me every time. Love them.